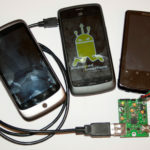 The AndropodInterface is a serial port for any Android-based mobile phone! It works without any modifcation of the Android device – just with your unmodified Android! What makes the AndropodInterface so special? Contrary to all other similar solutions on the market, like the ADK or the IOIO, the Andropod Interface allows it’s users to debug the phone application while the phone is connected to the Andropod Interface. This makes it super easy to develop applications for it! Also the Andropod Interface is usable for any Android phone with version Android 1.6 and above, so you can easily use one of your old phones to develop your project! What is the AndropodInterface for? The AndropodInterface is designed to be integrateable into your own project as easy as possible! You can use it for example in robots, drones, phone docks, gadgets or any project you can think of. What allows me the AndropodInterface to do? Ever wanted to have easy access to WIFI, 3G, 4G, Bluetooth in your project? Ever wanted to be able to get GPS data or accelerometer values in your project? Ever wanted to have a huge color display with touchscreen on your project?Then the AndropodInterface is the right thing for you! The AndropodInterface gives you the possibility to harvest all the functionality of your mobile phone for your projects! 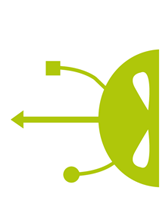 You want to read more about the Andropod Interface? In the Februar 2012 issue of the Elektor magazine the Andropod Interface held a top spot. Sounds good – but expensive, right? 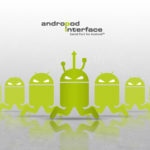 The AndropodInterface is FREE, you can download all resource you need on this page! The basic hardware for it will start at about 25€ / 35$ and is widely available at Digikey / Farnell / Newark / RS! The AndropodInterface has been developed with the Upper Austria University of Applied Sciences, Hagenberg, Hard & Software Design degree program. Wanna become hardware & software designer? Visit for more information! I don’t care about how it works, i want to use it! Just go to your favorite distributor and buy the widely available “Vinculo” (Farnell 1848970, RS 720-3723, Digikey 768-1088-ND) and a simple USB to TTL-level serial converter (but you should already own one of them 😉 – otherwhise for example Farnell 1740365) or a VNC2 Debug Module (Farnell 1825836, RS 708-0101, Digikey 768-1052-ND). Download the firmware, flash it to the board and you are ready to go! I want it small and modify the hardware to fit my needs! 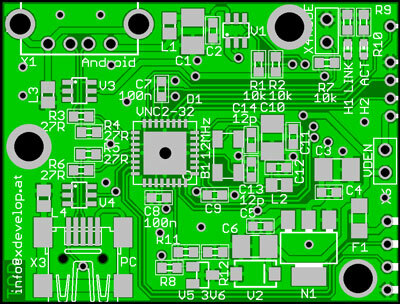 If you want the real AndropodInterface small and fully featured – just download the layout files, the placement and the firmware in the download section and start building it yourself! 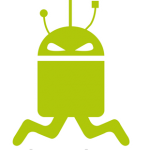 Writing Android apps that use the Andropod Interface is plain simple! Just use a TCP server on port 1337! Install the Andropod Configuration Software on your PC, switch the Andropod Interface to “Configure Mode” (you will find an image with the correct jumper settings in the software) and connect it to your PC using a standard Micro USB cable. Then you can configure the baudrate an other settings as required by your application. Save all changes and you are ready to go. Use four simple wires, two for the supply voltage +5V, GND and the two serial RX and TX wires. This is needed in order to make the magic hapen – don’t forget to do that! Start your application on the Android phone! Embedded systems constantly evolve and developing state-of-the art systems for educational purposes is a very time consuming and expensive process. In order to provide the highest possible processing power along with sophisticated communication interfaces like Wireless Lan, HSDPA and Bluetooth to embedded projects using cheap and well tested high-end smart phones would be the best solution. Currently the Smartphone market is split into a few different segments – the three major OSes are currently the Blackberry OS featured on most of the RIM (Research In Motion) devices, the iOS devices that is used on most Apple mobile devices and finally Google’s Open Source Android OS that is currently powering several hundred devices from multiple manufacturers. 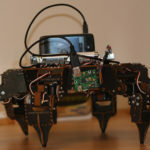 When using Smartphones on for example Robotic projects the cost, the availability and the openness and power of the software framework are the key factors. Considering these factors the Open Source Android platform seems to meet the demands at best. The devices are really cheap (from around 100€ or less) and available from a variety of different hard manufacturers and the software is completely open, thus it’s an open source project distributed partially under the GNU GPL and the Apache Licensing model. 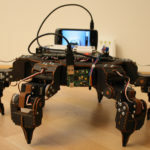 The big problem is how to communicate with Android-based mobile devices from custom embedded hardware in order to control robotics or for example sensor data. 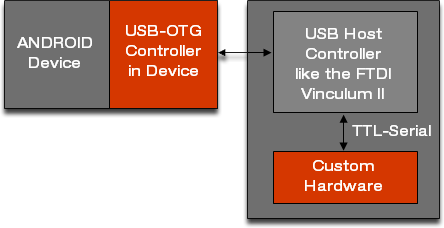 The general problem in this concern is that most Android devices (contrary to Apple devices) feature only one USB-OTG in port (a dual role – host or device – USB 2.0 port). Main objective of this document is to discuss the mechanisms to interface Android devices with any simple serial (TTL-Serial, I²C, SPI) or parallel bus. 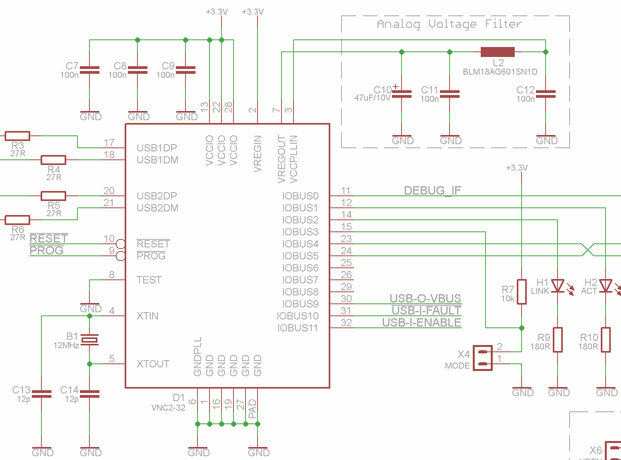 Another – on the first sight – more complex solution is to use the Android device’s USB controller in device mode, what requires the custom hardware to feature a more complex USB host port. Using a host port simplifies the work that needs to be done on the Android smart phone itself what should – in the end – lead to a plug and play solution for all Android devices. In order to ensure the plug and play experience that data exchange needs to be done over one of the following USB device classes already implemented in Android. In general only the adb and the g_storage interface are implemented across all Android devices – the g_ether device made it as “USB Thethering” to Android 2.1 and might be problematic to use on devices that have no Baseband – like the Archos Tablets, or devices imported from the US – cell phone carriers tend to disable this feature to reduce the overall cell network usage and therefore increase net stability. The storage interface is – at least in it’s normal configuration unusable for data exchange, as the device the USB subsystem accesses is unmounted from the Android filesystem and is therefore not accessible from any Android application. To bypass this restriction and keep the device (the SD card in most cases) mounted to the Android filesystem and shared via USB the device needs to be rooted and the mounting needs to be done manually. This procedure is absolutely not recommended thus two file system layers access one physical device, what might lead to the destruction of the written files and or the MFT. As mentioned above the USB tethering is quite new to Android and may not be enabled on all devices. If USB tethering is supported by the platform it would be a great solution to exchange data with the Android device as it tunnels standard TCP/IP traffic over USB. One of the major disadvantages the g_ether interface is the complexity of protocol (the low level USB – Ethernet protocol has to be implemented, along with a complete TCP/IP stack). If used with a host controller implemented in the main application processor this might lead to a very high system load and increased software complexity. 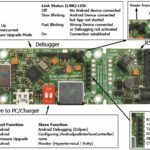 The Android Debug Bridge is designed to provide the user with extensive debugging capabilities, that include access to the system shell, forwarding of TCP ports, receiving and transmitting file from / to the phone. Despite to the g_storage and the g_ether interface the ADB protocol was developed by the Google developer team especially for Android and is therefore not implemented on any other platform than on x86 Linux/Windows/Mac. After a quick review of the source code of ADB the interface seems quite easy in general and easy to implement over all (more later). The ADB interface is supported by all Android devices since the very early version of Android and will be supported in feature versions of Android (as far as it’s possible to tell by now). Considering the almost unlimited availability of the ADB interface and the simplicity and the power of the ADB protocol this is more likely the best solution. After considering everything learned in the previous chapter this chapter describes the implementation of a black-box USB host for Android device to serial solution based on the Android Debug interface. 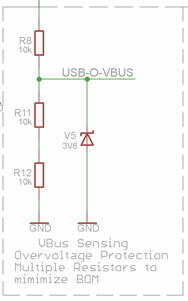 As USB host a Vinculum II from FTDI is used. The VNCII is highly optimised USB controller that features two dual role USB ports in combination with a 16bit core with Harvard architecture, 256kb of flash memory and 16kb of RAM along with several communication interfaces (UART, SPI, 8-bit FIFO, …). The Vinculum II is priced at about 3.50€ for low quantity orders (10 part or more), what is quite cheap considering the prices of “normal” USB serial converters like the CP2102(2,56€) or the FT232 (5,10€). FTDI provides a complete IDE with it’s VOS (Vinculum OS) that includes all necessary libraries for USB development, suitable evaluation kits start at 30€ and a fully featured debugger / programmer will cost around 20€ – so developing hardware with the VNC2 is really cheap and quite easy. 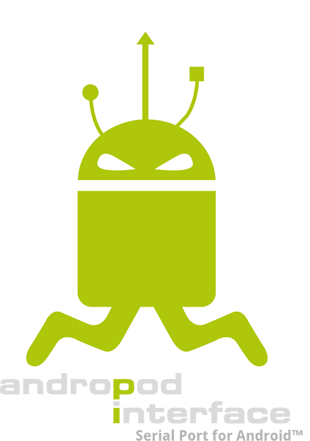 The Android Debug Bridge is as its name says just a bridge between the debugging PC and the Android device. It allows tunneling TCP ports (for example to attach to debugging session to the gdb server) as well as remote access to the system shell and file exchange between the client and the host system. Generally the ADB “driver” itself is always implemented in userspace (in Linux, Windows and Mac). The ADB software directly accesses the USB FIFOs of the USB device to be more specific the ADB uses only two FIFOs one incoming and one outgoing endpoint. The endpoints are bulk endpoints so no the data integrity is ensured by low-level USB layers. Considering all these facts the ADB USB layer is nothing more than a high speed serial connection that provides error handling and correction mechanisms. The structure and the data (limited to a maximum packet size of 4kb) is sent over the USB connection. The 32 bit data fields are converted to little endian byte order. The lower left part of the schematic shows a crystal and its operation circuit (two capacitors), the crystal should be quite accurate, as it’s the basis for the internal PLL and therefore a small inaccuracy sums up. The crystal used is the best mix of package size (3.2 x 5mm), accuracy (30ppm) and price (2.11€). As the load capacitance of the crystal is rated with 12pf CL as approximation for the calculation of C13 and C14 the equation C13 = C14 = 2 * ( CL – CS ) – while CS – the stray capacitance of the PCB and the wires can be approximated with 5-6pF. The upper right part shows an LC filter for the internal PLL voltage. The VNC2 implements a linear regulator (VREGout) that generates the internal PLL voltage (1.8V) – for proper operation an external LC filter is needed (as specified in the datasheet of the VNC2). The upper left part shows the default block capacitors, one capacitor for every voltage pin should be used. These capacitors should be selected somewhere around 100nF. To be able to give the user a feedback and to allow the user some configuration, two LEDs and one jumper have been implemented. 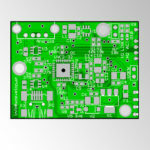 In order to minimize PCB size, 0603 green SMD LEDs have been selected. According to the LED datasheet the current has been selected at about 7mA – higher power only results in a higher temperature and only in a slightly higher light emission. As pullup-resistor a default 10k have been used (generally lower values are better when it comes to immunity to several distortions, but lower values also result in higher currents – 0.33mA with 10k should be a good choice). In order for USB to work 27Ohm resistor should be implemented (according to datasheet of the VNC2) on all USB lines. General series resistors with these values in series configuration are used to minimize effects of signal reflection. The power management generally consists of LD1117 low dropout regulator in a small SOT223 that should provide 800mA output current at the system voltage of 3.3V. In this case a linear regulator has been used, although a switching type regulator provides a much higher efficiency (66% to 85-95%) as the system cost, complexity and the EMI radiation can be reduced (~1.20€ to ~9€ and about three time the PCB size). Linear regulators also provide a lower output ripple and better load regulation compared to most output switching regulators (although the National LMZ series DC/DC converters provide really good performance). To protect the circuit from reverse applied input voltage – a combination of a polyfuse and a Zener diode has been implemented (the polyfuse triggers once the current exceeds 1.5A – this condition only occurs when the applied voltage to the Zener diode is below -1.2V). In order to ensure proper operation of the circuitry and to be USB compliant, an overcurrent protection has been implemented – the IC used is a MIC2005 from Micrel – a simple power switch that switches off when the output current exceeds 0.5A (or the IC temperature exceeds the internal limit). The open-drain output “Fault” indicates such a condition. The “Enable” input is used to enable the output power (power should be enabled by default – so pulled up to high, as long as the VNC2 doesn’t interfere). The output contains a standard LC network used to stabilize the output voltage and minimize interference coming from the USB connector. 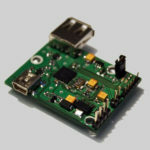 For the host interface a standard USB A connector has been implemented, for the device interface a mini USB plug has been selected (a standard B connector could be also a good choice – but mini USB cables are as common as USB A-B cables, but the connector consumes less PCB space). In order to minimize EMI noise effects small inductors have been installed on all USB power lines. To provide maximum ESD performance USBLC6-4 from ST semiconductor has been installed – basically these ICs are diode networks to protect the circuitry from high voltage spikes (kV area). Normally one IC can be used to protect both USB connections –but due to layout considerations two ICs have been used. 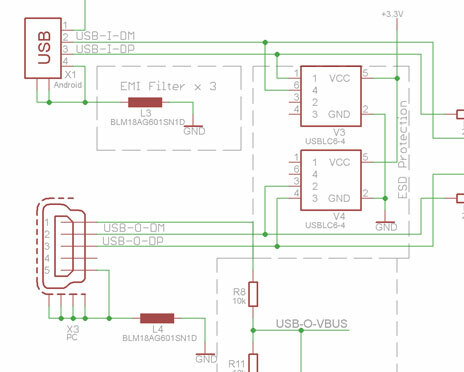 To be able to sense if a PC is connected to the device port, a Vbus sensing has been implemented – it converts the 5V supplied from the PC to a 3.3V logic high level – high voltage spikes (ESD, etc. ) are filtered with a 3.6V Z-diode. 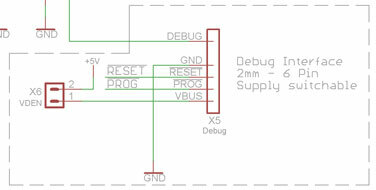 The debug interface is basically a 2mm pin header with a specified pinout – in order to be compatible with the available VNC2 debugger (FTDI VNC2 Debug Module). As the interface is considered as “safe” and not as hotplugable – no ESD precautions have been taken. The VDEN jumper routes the debugger power to the system, to provide debugging abilities without the need of an external 5V supply – you should note, that the supply current on the debug port is limited to 400mA – so the overcurrent protection is useless. The 4 pin connector used for serial communication with the embedded hardware contains only the basic RX, TX and ground connection – to minimize complexity no hardware handshake has been implemented. The serial connector is also the main source for the system power – the system should supply 5V at 750mA to the board. The voltage must not be without a range of +/-10% around 5V – to be fully USB 2.0 compliant the voltage must not be without a range of 4.4V to 5.25V. As again this interface is considered to be “safe” and only a in system connection – no ESD precautions have been made. 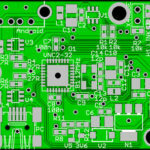 The tricky part of the AndropodInterface is definitively the firmware that needs to be programmed into the microprocessor. One of the USB ports is configured as slave, the other one is configured as host. All the data received from the host (the Android phone) and the slave (the PC) is read and sent to an internal packet “router”. This part of software analyzes all packets received form the slave and from the host and passes all packets under normal operation just from host to slave. If a packet contains information that it is sent to or from the TCP port 1337 the payload data is redirected to the serial port. Basically the development with the Vinculum II plattform is quite easy for higher level application – but more complex for the simple things, like setting a port pin. closed while this message was in-flight. A WRITE message may not be sent until a READY message is received. Note: The Information written italic is copied from the “protocol.txt” of the Windows / Linux ADB implementation.